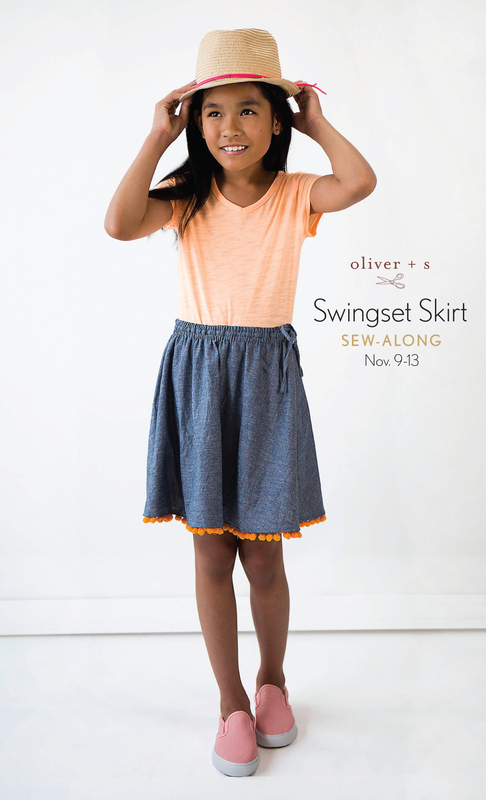 We are happy to announce that there will be big fun ahead as we will be hosting a Swingset Skirt sew-along next month. We hope you will join us! As you know the Swingset Skirt was updated with expanded sizes (including size 14!) recently. Liesl has already gathered Swingset Skirt inspiration and put together a Swingset Skirt inspiration Pinterest board, as well. And if that wasn’t enough you can get even more ideas from Melani’s favorite pattern post. We have something new, fun and exciting this time around. Six talented ladies have been gathered to form a panel. To kick off the sew-along, the first week of November we’ll feature each panelist on the blog. Each panelist will talk about their design decisions and fabric choices. You know the drill with these sew-alongs. Get your pattern if you haven’t already. It is available as an Oliver + S Singles pattern in both paper and digital format. Also gather your fabric and supplies, and we will see you in the Discussion Forums Sew Alongs group on Monday November 9th! Enter to win a $100 gift certificate to the Oliver + S website! When you have completed your Swingset Skirt, post it somewhere and then add a link to it using the button below. Any Swingset Skirts made since September 24th, 2015 can be entered. If you sew more than one skirt (because a girl can never have too many twirly skirts, right? ), enter each skirt separately. All entries must be submitted by Friday November 20th 11:59 PM ET. The six panelists will vote for their favorite, and the winner will be announced on Monday November 23rd. Is any body else having trouble loading the sew along button on their website? I copy and paste the code as a text widget but it doesn’t seem to work for me. Amy, that code window is really finicky…. I’ve just updated it. Try it now. It should work better.